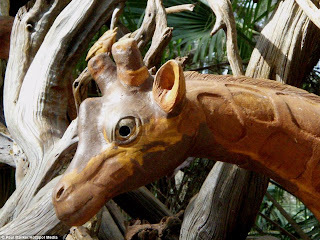 Teeming with wildlife like deer, giraffes, monkeys and dolphins, this sculpture bursts with the beauty of the natural world. [Left] Epic art: Sculptor Paul Baliker, 59, is dwarfed by his masterpiece A Matter Of Time, which is entirely carved from cedar driftwood. At the centre, inexorably linked to each constituent part, is a man. He holds a globe in his hand to represent our dominant species' unique duties as custodians of the planet. 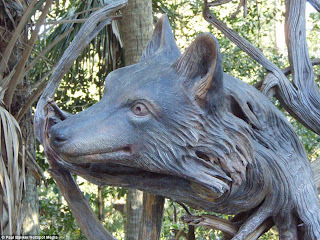 Crafted entirely from driftwood, the vast, thought-provoking masterpiece was created by sculptor Paul Baliker, 59, who describes it as a 'call to action'. 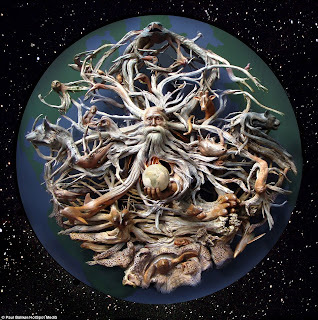 [Left] Unique responsibility: Mr Balrike said he wanted his sculpture to focus around mankind, 'since in this sculpture he holds the fate of the planet in his hands'. 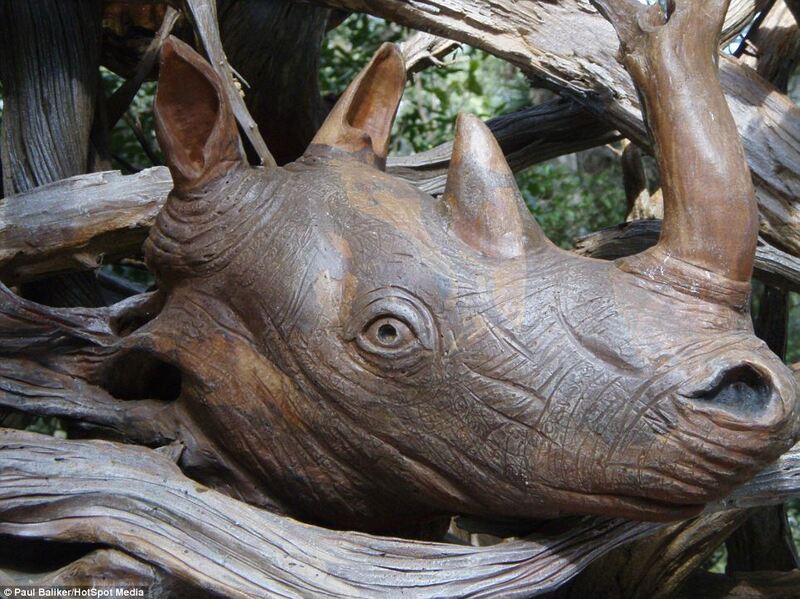 'I started out sculpting to put food on the table, I never dreamt of where it would lead,' he said. 'I hope that people can see the environmental message I attempt to portray, and perhaps think hard about the impact man has on the natural world. 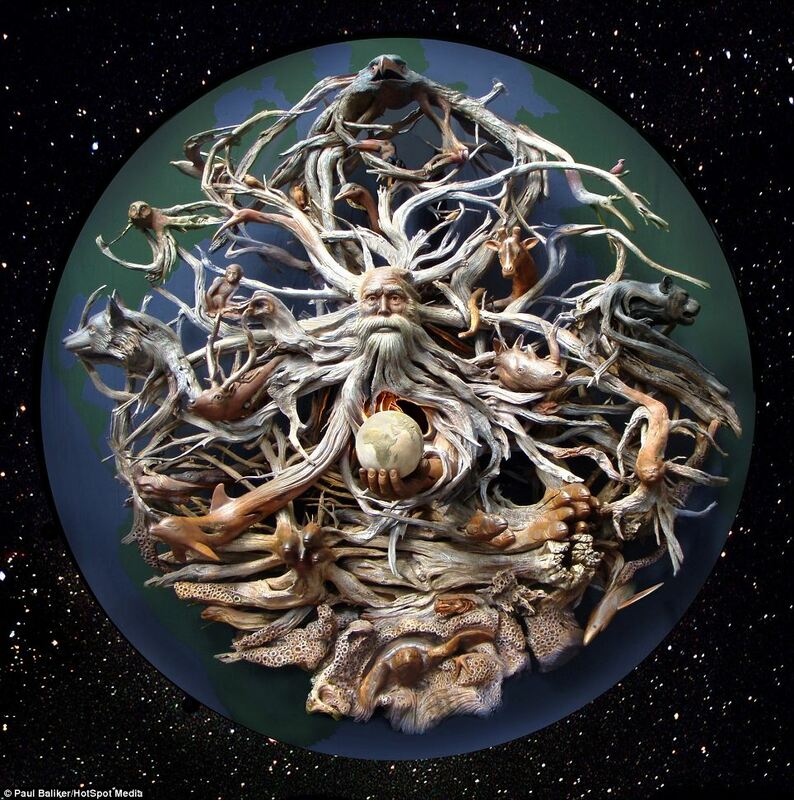 'I attempt to create one major environment statement a year, always on a massive scale. 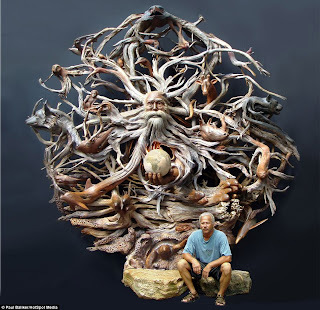 Mr Baliker spent six months creating his masterpiece. 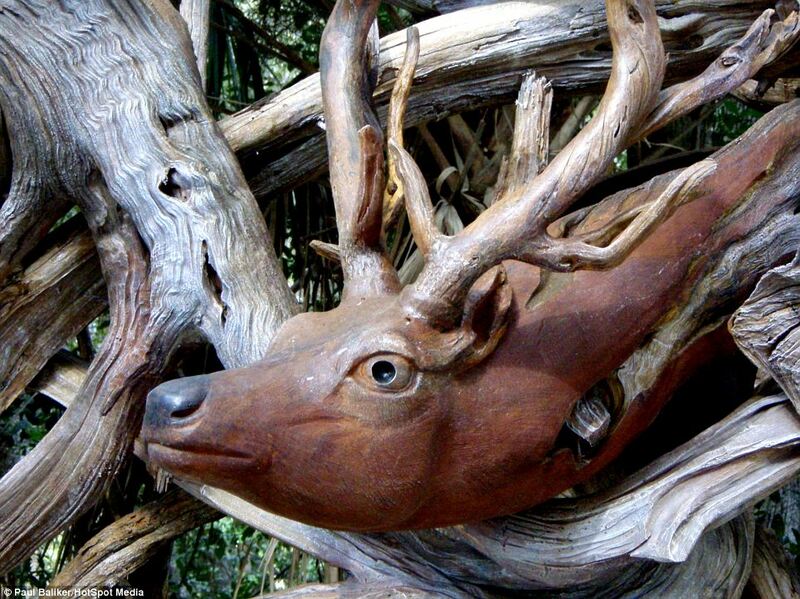 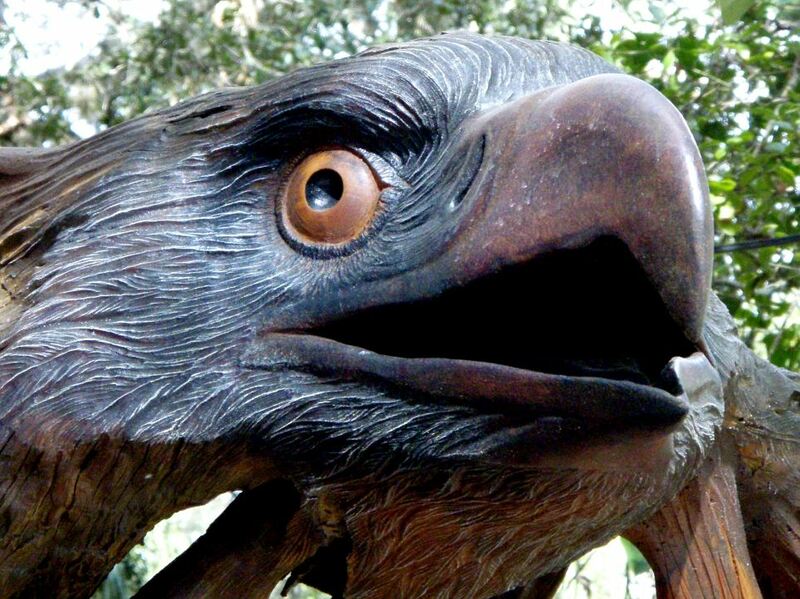 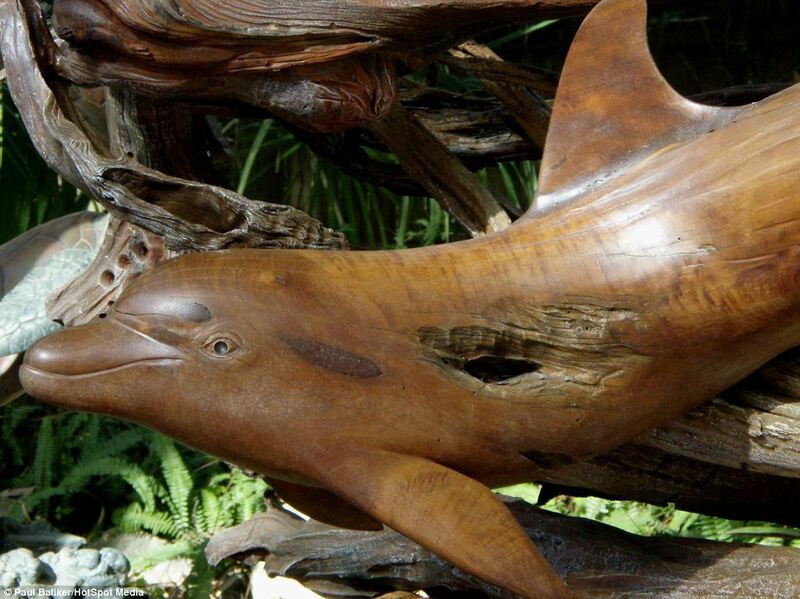 Using chainsaws, sanders and rotary grinders, he carefully carved each element from cedar driftwood collected around the Gulf of Mexico. [Left] Powerful but fragile: The detail of a rhinoceros's head in the sculpture, which is, in its totality, all about humankind's relationship to our planet. 'The sculpture had been on my mind for the past 15 years,' he said. 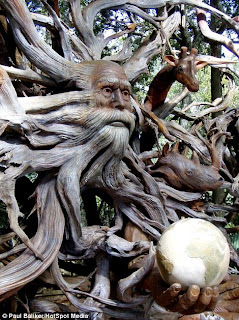 The sculpture, called A Matter Of Time, measures a massive 13ft by 13ft, dwarfing its creator, who says it's been warmly received. 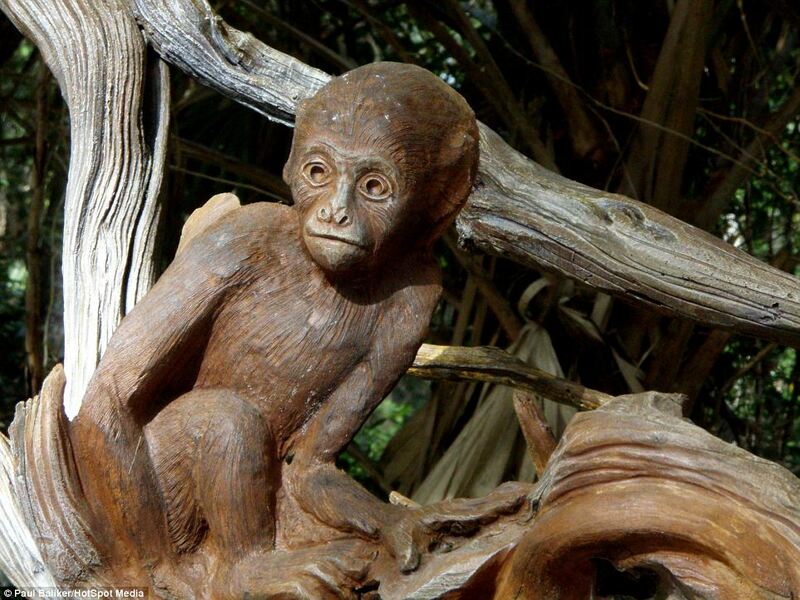 'I have seen tears in some viewer's eyes,' he said. 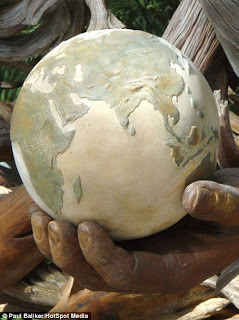 'I wanted this sculpture to focus around mankind, since in this sculpture he holds the fate of the planet in his hands. 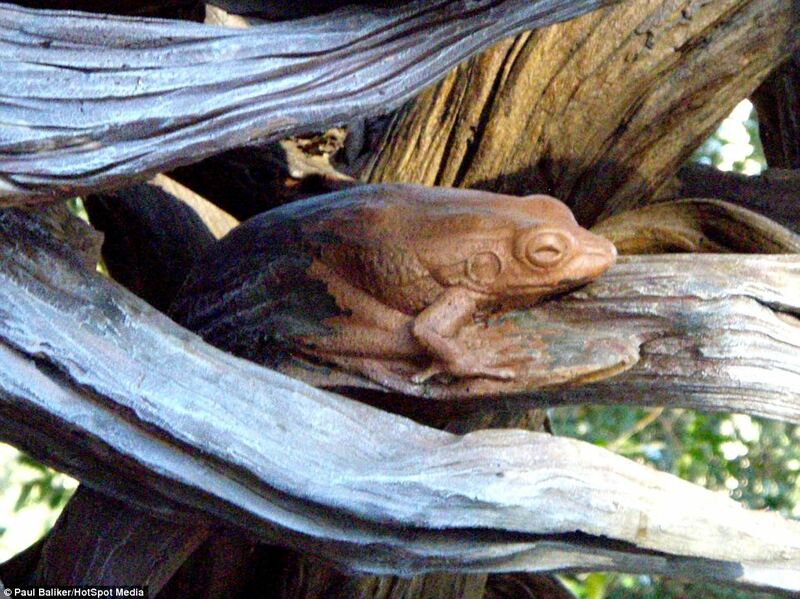 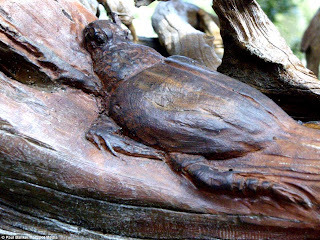 [Left] Everything is connected: At its rear this life-like frog blends back in to the cedar driftwood from which it is hewn. [Left] Harmony: A dolphin-like creature is sanded smooth, but the scar in its side - a feature of the cedar driftwood it is carved from - is an added poignant detail. [Left] You can almost smell the ocean: A crab detail worked in to the sculpture, which bursts all over with the beauty of the natural world. 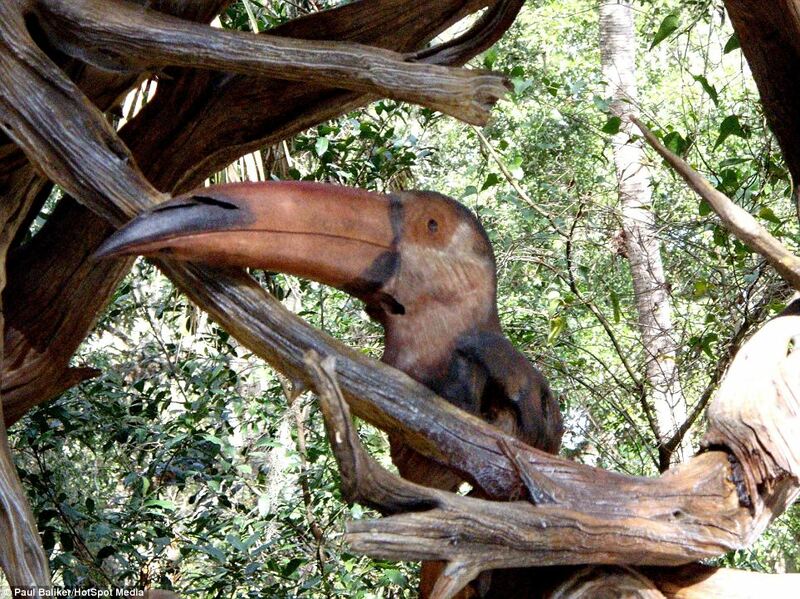 [Left] 'My contribution to a better planet': A toucan sits proudly near the top of the sculpture, which took Mr Baliker six months of intense work to complete. [Left] Crowning glory: This eagle's head peers out right at the top of Mr Baliker's immense and thought-provoking environmentalist masterpiece. [Left] 'I hope that people can see the environmental message': Mr Baliker says he tries to create one major environment statement a year, always on a massive scale. [Left] Natural beauty: The varying colours of the cedar driftwood add unique and unexpectedly appropriate texture to Mr Baliker's carvings, as in this bust of a giraffe. [Left] Fierce: A panther rears out from the sculpture, with the powerful, sinuous muscles of its neck seamlessly blending into the contours of the driftwood it's made from. 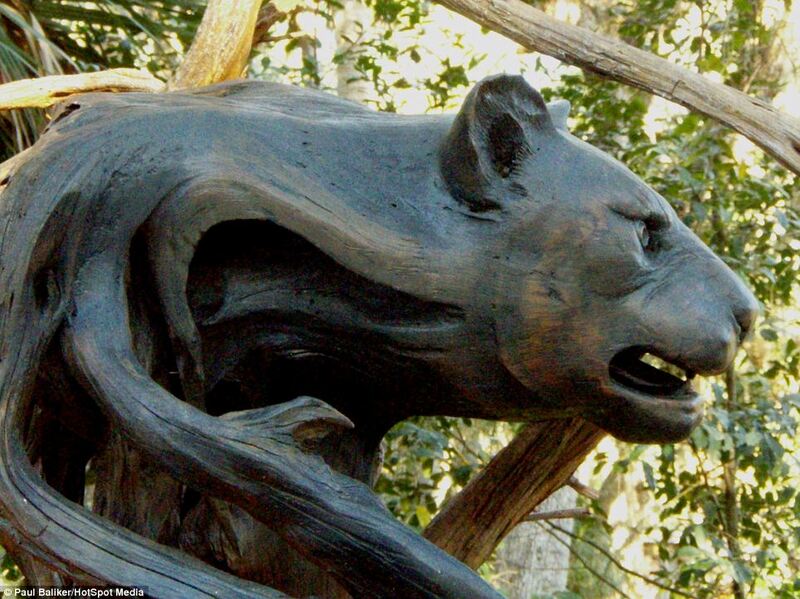 [Left] 'I have seen tears in some viewer's eyes': The sculpture, called A Matter Of Time, measures a massive 13ft by 13ft, dwarfing its creator, who says it's been warmly received. 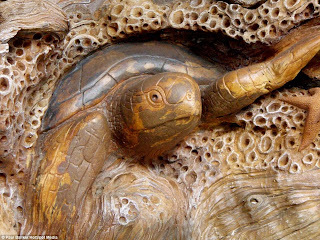 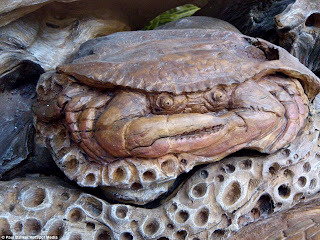 [Left] Bursting out: A turtle appears to climb from within the driftwood sculpture, with the textures around it meant to represent the ocean's froth and spray. 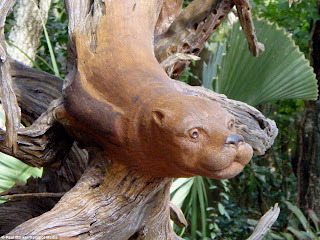 [Left] In tune with nature The sculpture seems to free spirits already present, like this otter whose tortuous body emerges from natural curves in the wood. [Left] Spiritual: This deer's antlers have been created by the choice of the perfect piece of driftwood already with many-forking branches.